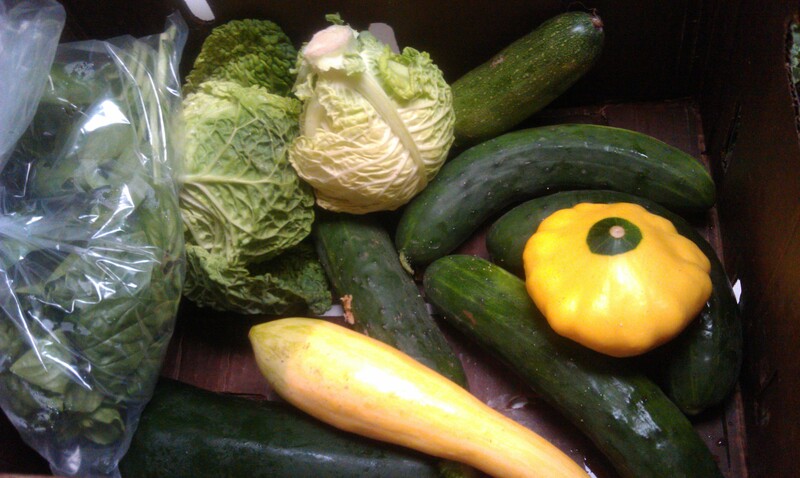 Opening the CSA box is like opening happy Pandora’s box. It’s a big surprise — I actually get excited. I wanted to let you know that the CSA sent us a cookbook in the mail with pictures of the produce and when to expect it. Even with that help, I’m having trouble with the herbs. The herbs are drawn, not photographed, and I can’t match them to what I’ve got in my box. I was excited when I saw the onions. I have to tell you I compared them to onions I had in my fridge’s crisper and I was shocked. The fresh ones were almost pretty. Definitely more robust. Kale, small celery(? ), Purple flower herb, random herb. Need help please! I don’t have a clue what these are. Here’s what was at the bottom of the box. I identified arugula in the bag, cabbage heads, cucumbers, zucchini, yellow squash, another patty pan squash (thanks for naming that one for me last week). Wow, what a bounty. 1 bunch of small celery? Not being able to identify something makes it hard for me to cook with it. I’m a decent home cook and I’ll take limited risks with straightforward recipes, but being creative in the kitchen with brand-new foods is hard. I still believe I’m over my head with the CSA, but thankfully I’m not curled up in a ball and rocking in a corner. Thanks for all your terrific suggestions with last week’s CSA post. I loved the idea of garlic scape pesto, but considering I’ve never made a regular pesto, I decided I’m not ready for that. I got those gorgeous onions from the farm (see above picture), but I already had ten yellow onions that I had purchased from the store the week previous. I needed to use those up and fast. I remembered that when I’d roasted a chicken, using Jamie Oliver’s recipe from the Food Revolution cookbook, my husband had gone nuts for the roasted onions. So I thought I’d try that with the garlic scapes. This is the world’s most basic recipe — it’s for a beginner like me. I served the onions with red quinoa and large pan-fried sausages. Preheat oven to 400 degrees. 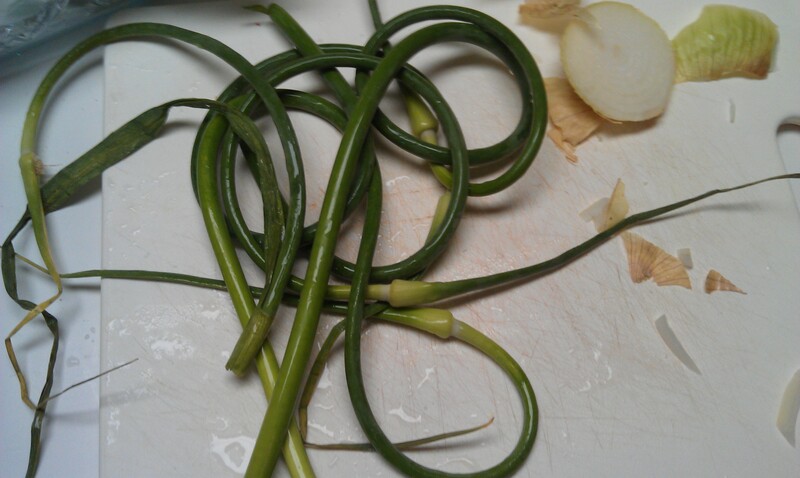 Chop onions in quarters and then chop garlic scapes. 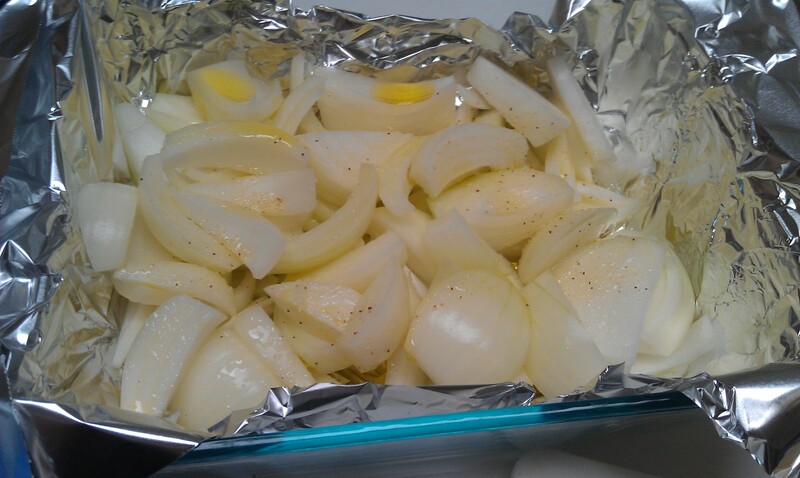 Place onions on a foil-lined baking sheet or roasting pan. Scatter the garlic scapes. Drizzle liberally with olive oil. Sprinkle with salt. Toss. Place in the oven for 25-30 minutes depending on your oven. I ended up switching to a 13 by 9 pan. This is far too crowded for even cooking. Getting the scapes prepped. I keep wanting to call them garlic “snapes” — I must have Harry Potter and Professor Snape on the brain. Now only if I could get childcare so that my husband and I could go out and see the movie! Man, I love Alan Rickman. Another before shot. I didn’t do an “after” shot because I wasn’t sure I would share this recipe with you because it’s incredibly boring and nowhere near fancy. But hey, why not? The onions were a big hit with my son, which surprised my husband and me. The kid hates quinoa now, too. Win some, lose others. Looks like fun! In your mystery picture, it looks like kale on the left, flat leaf (Italian) parsley in the middle, and sage on the right. Thanks for sharing! I agree with the Kale, parsley and sage. The purple flower looks like the mint family- could it be “anise hyssop”? or some kind of basil? Taste it! The herb on the right is definitely sage. I think the one with the purple flower is a mint, but I’m not sure which. Try a little and see what it tastes like! Sage definitely is the herb on the far right. 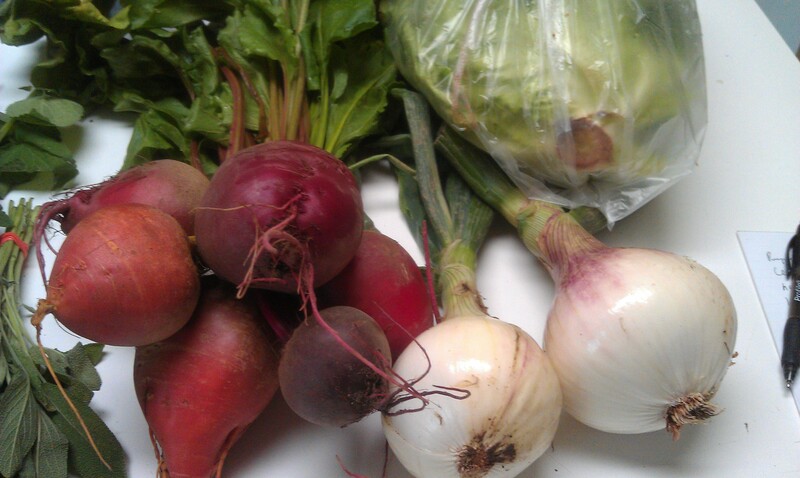 I got beets in our CSA last week along with onions and roasted the beets w/ onions in a bit of olive oil. Skinned the beets after roasting (they popped right out when run under cool water) and then I quartered & salt/peppered. They were absolutely delicious! You and I have the same CSA. I wonder if the “purple flower herb” is either chive flowers or borage? I didn’t get that in my box this week. Btw, don’t put it in a bundt. Too much scrubbing. 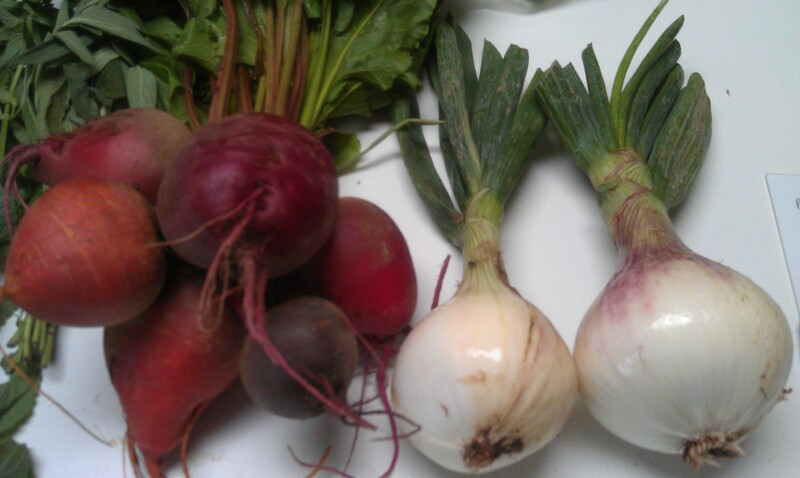 Also – When you roast the onions – toss in the beets. Roasted beets are awesome! Also – those fresh herbs – in the last 5-7 minutes of roasting toss them on your veggies. When ever I have a surplus of onions – I make Simple Onion Soup! Sautée garlic in olive oil on med high until golden (be careful not to burn of the soup will be bitter), add in the onion, pinch of kosher salt and a pinch of sugar. Sweat the onions on med high for about 10 min. Reduce heat to med and sautée until all onions are golden brown. Add in sage & sherry. Cook until the liquid evaporates. Add in stock, salt and pepper to taste and simmer for 10 min or so. While simmering, toast a hunk of fresh bread. Serve over toast with a sprinkle of Parmesan Reggiano. If you want to try something different with the beets, you can make beet hummus! Great on crackers or even baby carrots. 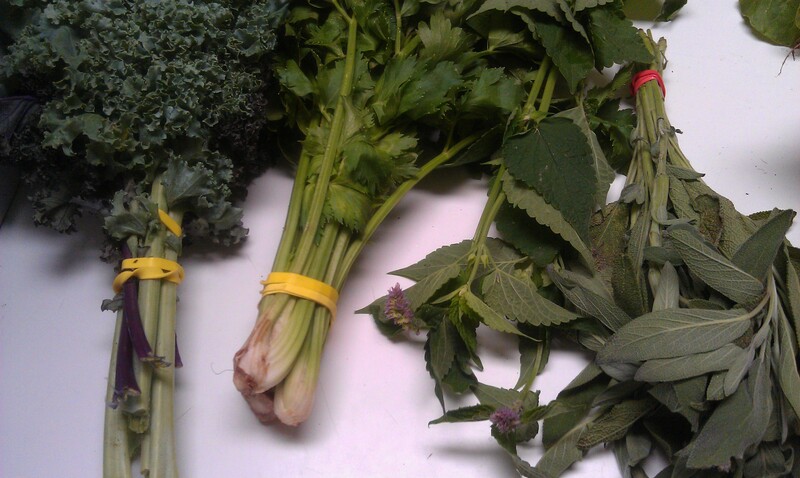 I think the mystery stuff looks kinda like Italian parsley and maybe the herb on the right is sage? I agree that the mystery herb looks like sage. One thing you can do with mystery ingredients is taste a little of each. If they taste good together raw, they usually cook well together. My CSA does a lot of Asian greens that I just cannot keep straight, so, when I get them, I taste and bag what tastes similar, knowing that I can prepare them the same way if they’re related. I had never made pesto before when I made my garlic scape pesto. Trust me. It’s easy (if you have a food processor) and amazing. I also sauteed the garlic scapes in little pieces with chicken but it wasn’t that great, whereas the garlic scape pesto was fantastic and never to be forgotten. I agree that the top random herb looks like sage. Google Image “sage” and I think you’ll agree. When I’ve had beets, I’ve either made borscht (a recipe someone gave me years ago, maybe from the Moosewood Cookbook or something like it) or just boiled them (a recipe from the internet). I think purple flower herb is borage. Mystery herb is definitely sage as many have said. Your CSA veggies are really beautiful. I love seeing pictures of them! Yes, agree it is definitely sage on the far right & kale on the far left. The middle I had at first thought was cilantro based on the way the leaves look but after reading other commenters now I don’t think so – the stems are not the same. So not sure! My idea for the sage is to pan fry it in a little EVOO til crispy, drain on paper towels & add salt & pepper & top a pasta dish. The one I have made before & topped w/ sage is a pumpkin pasta which is more of a fall recipe but I bet it would go on other things too. Also it is just yummy eaten plain! I just googled sage recipes & it came up w/ sage w/ pork chops & sage on pasta. Good luck Mrs Q & enjoy! my favorite for beets is “harvard beets”. there are tons of very similar recipes on line. for the herbs.. take your suggestions and use google images to see many other photos and match them up. I agree that the bunch next to the kale looks like flat leaf parsely. I think your purple flower herb is spearmint, try google image search an compare the flowers. The one on the right is definitely sage which goes on chicken pretty often. I would say the one in the middle is lovage not baby celery. The purple one has leaves that look like lemon balm but it’s hard to tell. Best to tear a leaf and smell it. The one on the right is definitely sage. I agree that the 2nd from the left is lovage, not parsley. Try chopping the leaves and slicing the stalks and adding it raw to tuna salad, pasta salad, or potato salad. Yes, I think thats sage. Its so good if you slice the leaves in thin strips and make a brown butter sauce. Its so simple and great on squash! There is no parsley. What people are thinking is parsley is the celery. The herb on the right is without a doubt sage. The purple flowers is probably a mint. It is not chives although chives have purple flowers they dont have leaves like that. The celery is small like that because when it is grown on a farm it doesnt get as big as places that specialize in celery that supply grocery stores. I would make a soup with it or a salad you can eat the leaves as well. and the left is kale. I agree. It’s almost certainly celery – and if it IS, it’s going to taste WORLDS better than any celery she ever got from the store. Mmm. I’m thinking it could be celery or lovage. Take a little taste. If it tastes like celery, then that’s what it is! I think the mysterious purple flowering plant might be a variety of shiso (aka beefsteak plant, in Western countries). As the other commentators have said, taste it! If it tastes like no mint or basil you’ve ever had, then it’s probably shiso. The stuff tastes great in stir-fries, pairs with well with all sorts of meats, and I enjoy it as an addition to my salad greens for an extra flavor kick. I agree with roasting beets. Easy as pie. I do it for about an hour with whole garlic cloves and a lot of olive oil. Peel the beets when they cool (it will stain your hands). My husband and toddler love them. I am all kinds of jealous of those beets and squash! If it wasn’t so hot this week in Chicagoland I’d say a roasted veggie medley would be wonderful! Maybe some pickling is in order? One thing that’s great to do with onions is to make “onion jam.” Slice the onions very thin, heat a little olive oil and/or butter, and saute the onions gently (medium heat) with a little salt. 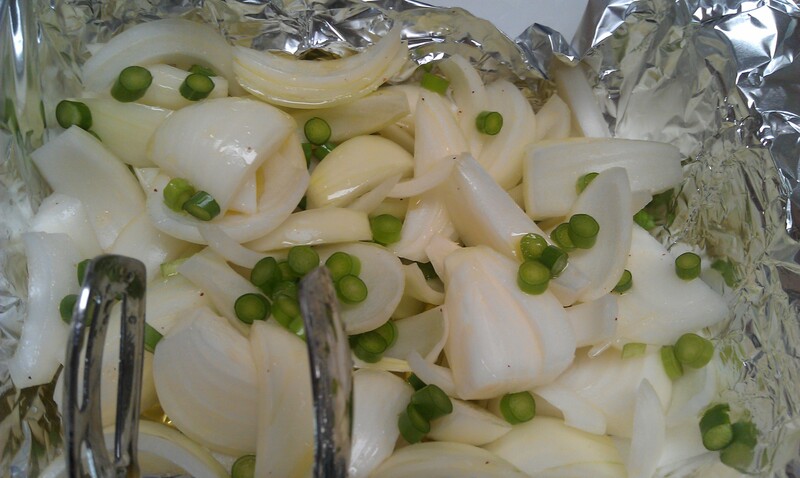 When the onions start to turn golden, turn the heat to low, put a lid on the pan. Every so often give them a stir, until they’re a deep golden brown. Absolutely fabulous on turkey, chicken, or beef sandwiches. Good plain on toasted bread too. Next time you roast chicken or turkey (whole or cut-up parts), slide your fingers under the skin to break some of the connective tissue and then slide some whole sage leaves between the skin and flesh before cooking. You can also do this before cooking poultry on the grill. The result is so yummy! People will fight over the roasted sage leaves! Poultry and sage have a natural affinity for one another. Same is true for pork and sage. The long yellow squash that looks similar to zucchini is crookneck squash. Sometimes crookneck squash has a narrow end and a fat end. Sometimes the narrow end curves slightly. Most people just call all of the foregoing yellow summer squash but if you see a recipe that calls for crookneck sqash, that’s what it means. The cabbages look like savoy cabbage. They’re great in the braised cabbage (with bacon) I described when I commented on last week’s CSA. They also keep for a very long time if you have a cool, dry, dark place to store them. I stock up in Sept. & Oct. when they’re in season here (central CT) and use them throughout the winter. They’ll keep until early spring if I store them in a dry corner of my basement away from any windows in plastic milk crates (just in the crates, no plastic bags, they need to “breathe”). I have better luck storing savoy cabbage over winter than I do with regular green cabbage and purple cabbage. I have good luck doing this with winter squash, too. Mmm, that does sound good. I use butter with garlic and rosemary under the skin, and sometimes thyme as well, but sage would work too. The purple leafed-one looks like lemon balm, sort of. The mystery one is sage.